A good friend of mine was telling me how Forza Motorsport 4 has cost him over £100 since last year’s October release date. His enthusiasm for everything Forza related has far from dwindled and after purchasing every DLC pack, the racing title remains in pole position as the most played game in his home. As a frugal gamer, I often find myself getting frustrated with my friend who would rather pre-order limited editions at the maximum price and end up with an extra character and a few postcards for £60, only to then spend an additional £40 on extra download content because he failed to take advantage of the DLC Season pass. This conversation made me ask if the £100 video-game is going to become more commonplace in 2012. We all have our favourite game of choice and if you can add to that experience by getting more of it, then it can only be a good thing. That said, the same question I keep hearing is: Are gamers getting more hours out of each release or simply spending a lot more on each release? 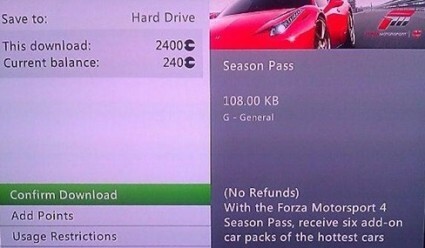 A season pass could end up saving you money. If there are people out there who have spent over £100 on Forza 4, it is of no surprise to hear that Forza Horizon will be released during the Christmas silly season, in yet another attempt to milk a cash cow for every last drop. We have all seen this happen many times over and our favourite franchises become stale very quickly. Maybe it’s also almost impossible to justify a cost-to-value ratio with a £100 game, so what is the answer? Before you think this is going to be another “Rip-off DLC” article, I think it’s fair to say there are many positive examples. The most recent being Max Payne 3, which already boasted a meaty single player campaign and enough additional features to keep even the most easily-distracted gamer happy, making it worth every penny of the retail price. 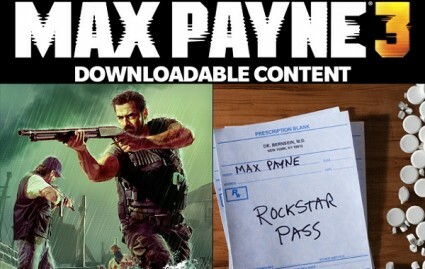 Additionally, you can purchase The Rockstar Pass, which grants you access to download all upcoming Max Payne 3 DLC and can be purchased for 2,400 Microsoft Points (Xbox Live), or around £20 in real money which is a 35% discount compared to purchasing the content individually. A quick look at the DLC release schedule for Max Payne 3 illustrates that for £20 you will be kept pretty busy until October. With a total layout of around £55 with individual prices, there is a strong argument that this represents very good value for money. This also demonstrates a very cunning, shrewd and calculating manoeuvre by Rockstar, because once the DLC for Max Payne 3 finishes its run, you can guarantee that an almost identical package will be announced for their next release: Grand Theft Auto V. There might even be room for a Max Payne Game of the Year Edition to maximise profits even more. This will ensure a steady 12 months income from only two releases, showing fantastic business foresight. Something that many other struggling publishers could learn from. By simply following a few simple rules and ensuring that a game represents fantastic value at release, with a wealth of extra content for a reasonable price, most gamers will be very happy. This is also a much better way of dealing with the thorn in their side, the second-hand or rental market. Rather than piss off your community by making them purchase online pass codes, why not simply produce a game that is packed with features and value that stops you wanting to trade it in for something else? Although Rockstar Games have never said that a DLC pass is a sales tactic to deal with the used games market, it seems an alternative way of tackling the problem by simply encouraging gamers to keep playing rather than discarding the title after a few weeks. This is not rocket science that we’re talking about here. If a game consists of a 6-8 hour single-player campaign and with a rushed online component that is tacked on, and then requires an online pass, I can tell you now that we probably won’t be holding onto it for very long. If you make something that is great value and makes gamers want to keep playing at a reasonable price, nobody will be renting or trading in your game. Unfortunately, not many publishers have this kind of business acumen and seem as out of touch with their customers as the dinosaurs in the recording industry. They will ultimately perish in the same way. What are your thoughts on this? 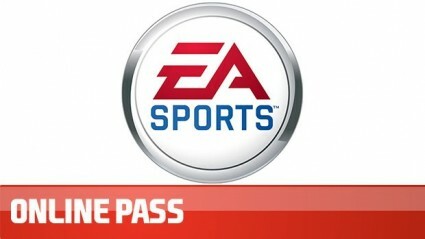 Would you happily pay £20 for six months worth of DLC rather than an online pass, or is there room in the market for both forms of sales tactics? Let us know your thoughts on this prickly subject by posting a comment below.